I recently found myself looking at the Blowout Cards specials and contemplating the purchase of a box of 2008 Razor Signature Series Baseball. (I’m not sure what Blowout was selling it for, but the local card shop was asking more than twice that price last year when it came out.) Less than $4 per autograph plus some free base cards didn’t seem like a bad deal; then I remembered how little fun I had with a couple of half-price Tri-Star blasters. Baseball cards are usually only fun for me if I recognize the players. Then I clicked on the non-sports section for some reason, and saw this. 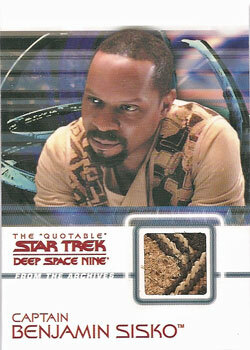 The ‘Quotable’ Star Trek Deep Space Nine? 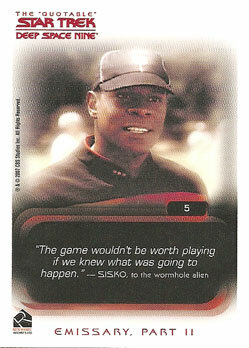 How could I resist a set of cards featuring some of the best lines from my favorite incarnation of Star Trek. For just over $50 shipped, I was promised an autograph and two costume cards, plus I could reasonably expect a complete 108-card base set out of a box with approximately 200 cards. Sold. The box arrived today, so I had the fun of opening them after I got home from work. 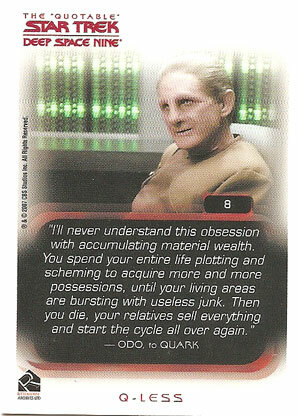 As you might expect with the theme of the set, each card features a (more or less) memorable quote from a particular Deep Space Nine episode. The longer the quote, the smaller the photo. What surprised me is that all the cards were double-sided – there was a quote and photo on both the front and back. This was a nice bonus — I rarely look at baseball card backs, but I made sure to flip all of these over to look at both sides. The only drawback? It was a little difficult to sort the cards because I had to keep looking for the number. I was able to make a complete set, plus I have a nice pile of doubles (and a few triples) left over. I didn’t get the autograph I was hoping for — somebody from the main cast would have been nice. Adrienne Barbeau only appeared in one episode, and I had to look up her character at Memory Alpha to recall anything about her. On the other hand, Barbeau has had a nice career and was the voice of Catwoman on the 1990s Batman cartoon show, so that’s kinda cool. The costume cards more than make up for it. Two main cast members; one featuring a swatch from a Starfleet uniform, the other featuring an interesting fabric from the vest Captain Sisko wore in the episode “Explorers.” I don’t know what it is, but I’m much happier with them than I’ve ever been with any of the baseball relics I’ve pulled. There were a handful of other inserts, too. 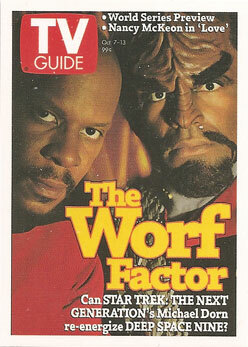 My favorites were the TV Guide Cover Cards, which were inserted at the rate of 1:20 packs. The scans really don’t show it, but they have a refractory effect going on. 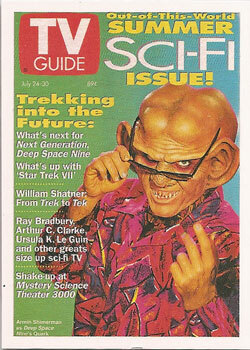 I remember having the actual TV Guide with that hideous Quark cover, so it was cool to see it again. There is also a 9-card double-sided photo montage puzzle, with cards inserted at the rate of 1:8 packs. I got the expected five cards in my box; I’d like to track down the other four at some point because it seems like a nice set. And there are these horrid mini-foldout comic cards, which are thankfully inserted at a rate of 1:35 packs. Unfortunately, I got two. This is the most fun I’ve had opening a box of cards in a long time. 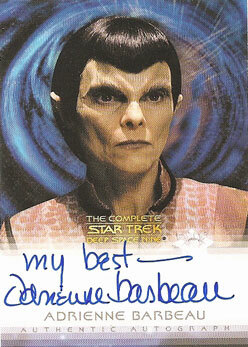 If you’re a card collector and a Deep Space Nine fan, you should definitely consider this set.